Calendars. Perhaps they should be obsolete with all the devices surrounding us that can tell us the date. But I’m a spatially sensitive person who likes everything in its place when it comes to referencing things, like the date, regularly. Turns out I just really love calendars. Actual on-the-wall calendars. I also love fabric (just to state the obvious). And tea towel calendars are wonderful — kitschy in the best way. I really wanted one this year and was holding back, thinking maybe I didn’t need a calendar for 2013, maybe I didn’t even need a physical daytimer, maybe I should just use the iPhone as intended… I was wrong on both accounts. I’m pretty digitally savvy, or at least functional, but I do love to look at a calendar and to write appointments and notes in a book. 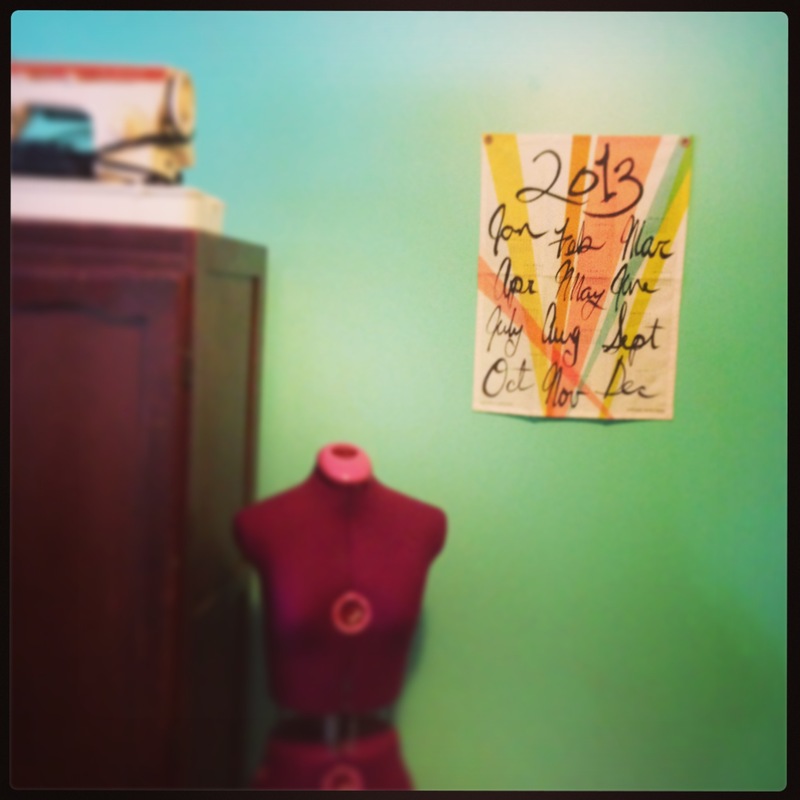 My brain likes it, my fingers like it, I feel more grounded and sure with paper and fabric and tangible-ness around me. So I got my usual Moleskin daytimer and felt a little bit more myself. Which isn’t to say I don’t also use my iCal for appointments, I do, but I don’t trust it totally yet in spite of years of use. And I waited too long on the calendar, my fave was sold out by the time I decided I should do it. So I thought perhaps it was a sign, perhaps I’d try without. Then I saw one of my favourite Canadian textile artists Averil Loreti at the Toronto One of a Kind show and her calendar was so beautiful, a burst of joy in a surprising and pleasing colour palette. But I still held back thinking iPhone and iCal could, possibly, fulfill me. I didn’t even last a month into 2013. I got the calendar. All is well in the world — I am moored, no longer adrift. Whew. Today I am 1! Or rather, this blog areI are 1. I find that my usually-verbose self is quiet, not much to say of late, lots of percolating. And having moved to a new city and a new house over the holidays, I seem to have a moving/displacement hangover that’s taking a while to lift — probably the time of year too, I just want to hibernate, sigh. But alas, I am not a Bear and so I solider on! My first post of 2013! And almost a year of blogging for me. 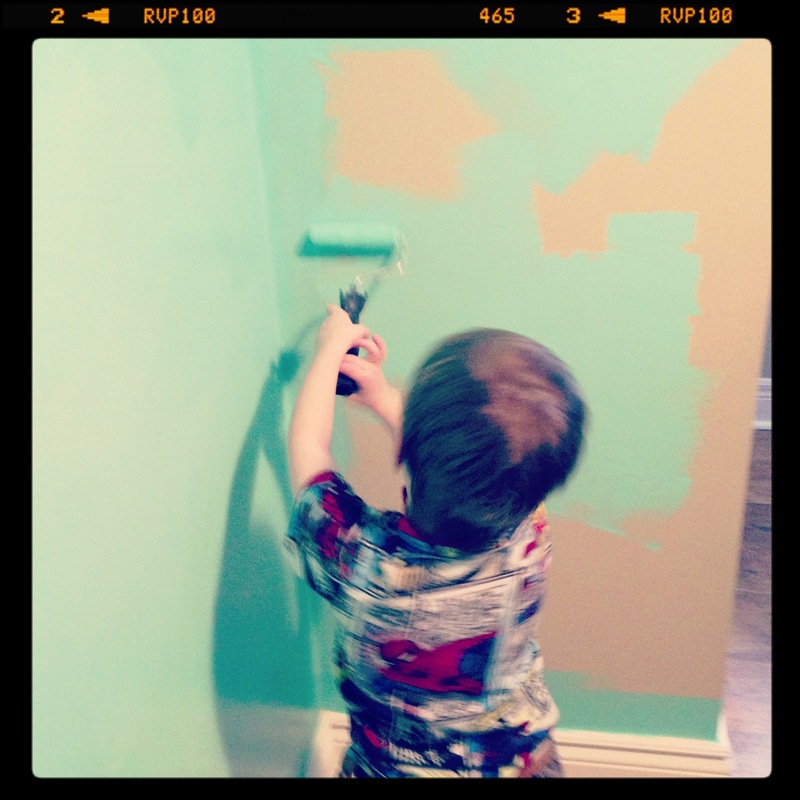 This is the story of a Christmas project I undertook in July during our road trip from Southern Ontario to Alberta and back again. Because sometimes I am awesome I had the presence of mind to take yarn and needles in the midst of getting our family on the road and planned to get most of my xmas gifts done whist whiling away the miles with my favourite pastime. 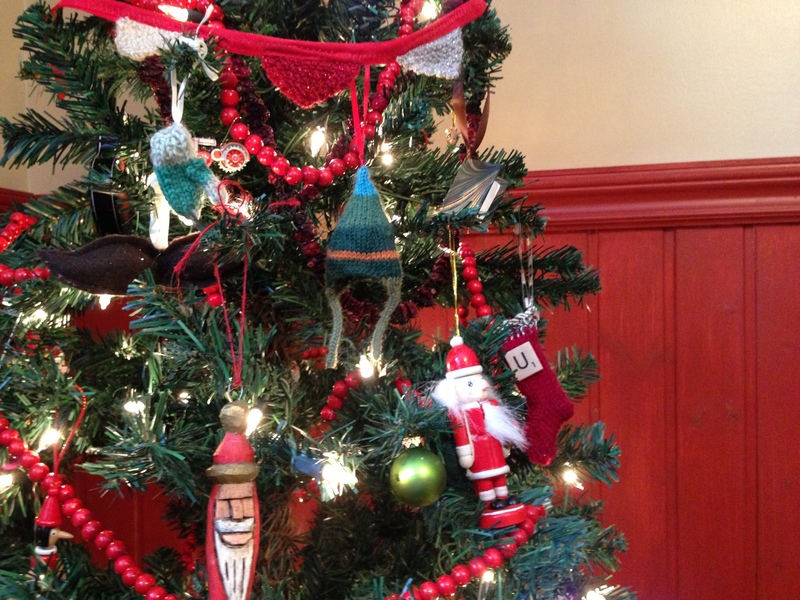 I must say I was inspired by the gifts of my dear friend Christa, who’s been making wee knitted ornaments for years now for her friends. Each piece, a mitten, heart, snowflake, stocking, etc, carries the memories of the christmas it arrived with us and is woven full of the creativity and friendship of the maker. Flying along an Ontario highway, I fiddled with my pattern for a full-sized hat til I was happy with the scale of the hat. I had the whole trip ahead of me, about 10 days of six-eight hour drives in total. 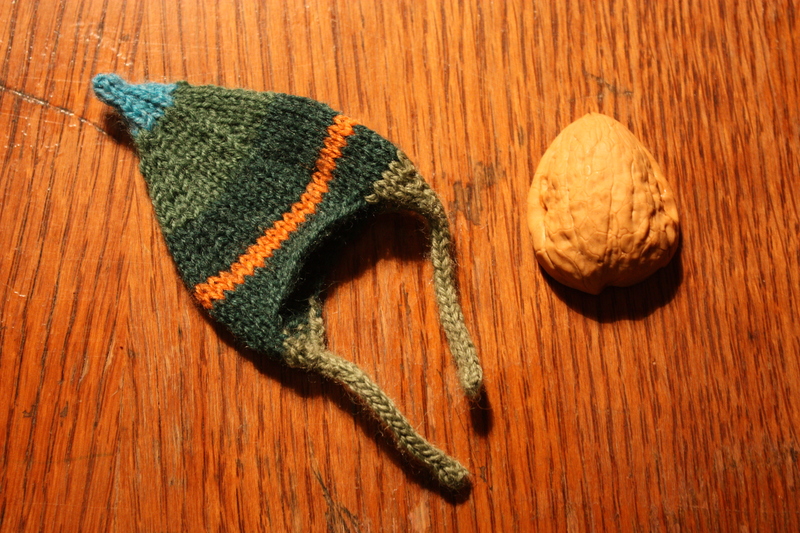 By the time we hit Michigan I was humming along, the second hat shaping up. After that each one took about two hours. That’s way more than time I’d usually be able to afford, but it was perfect for the road, allowing me to ignore squabbling in the back seat til it was at intervention-pitch and also freeing my mind to sail about as it does while knitting (I’m sure the knitters among you know what I mean!). 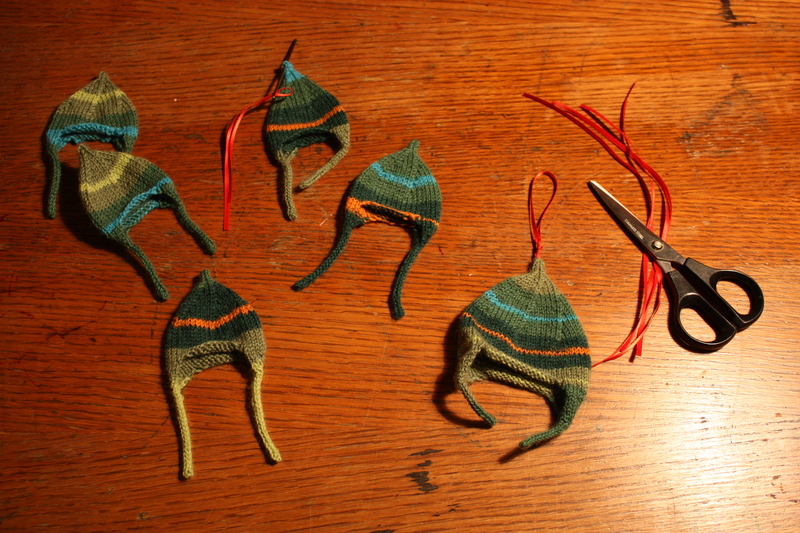 I finished five-and-a-half hats on the way to Alberta and figured I had about eight more hats in me on the way home. Tiny hats for everyone! Somewhere between Southern Alberta and the Cypress Hills of Saskatchewan I got back on the knitting-train and finished hat six. Hats seven and eight grew as we flew across the Montana, North Dakota and Minnesota. I was (and I am not exaggerating) six stitches from being done the eighth hat. We were all cranky and we all had to pee. We stopped at a Wisconsin truck stop. We peed. We bought charming state magnets for the states we’d driven through. We got snacks. We watched a biker couple arrive on separate bikes and have a loving exchange that belied their tough-as-nails exteriors. We stretched. We got back in the car. 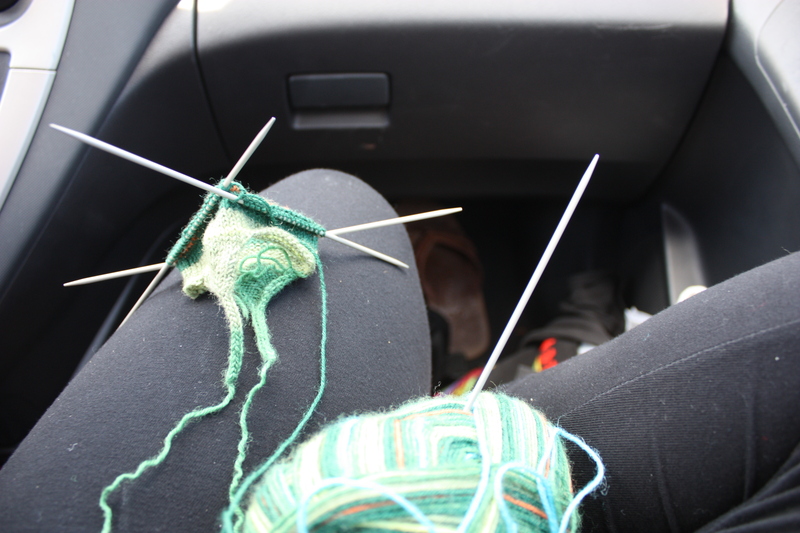 After a few miles I reached for my knitting. Not at my feet. Not. At. My. Feet. Got a zing of panic through my chest. Tore up my bags, swore a lot (always classy in front of the children, ahem-hem). But that lovely ball of delicate computer-dyed wool, my tiny bamboo needles, and my NEARLY-DONE hat, gone. I must have kicked them out of the car when I got out or in, but I never felt it didn’t see my little knitting lying lonely on the pavement. There was a moment when I could see Adam calculating whether he’d be a happier husband if he turned around … he suggested it was a bit funny and I told him I needed about 35 minutes before it was even remotely funny. There was a lot of deep breathing and muttering from me. Eventually I could laugh, if that was the worst thing that happened on the road, I could take it I decided. I like to think some biker dude with a secret knitting hobby scooped it up and finished it. That’s the story I’m sticking to. There were less hats than I’d planned for xmas gifting. And I didn’t have the heart or time to make more once we were home. But the ones I did make are probably that much better for the adventure attached to them. So if you received a little hat from me, now you know: it’s part of a pretty exclusive run of seven pieces. Number eight is on a biker’s tree in Wisconsin, I’m sure of it.